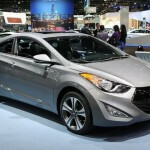 The new 2013 Hyundai Elantra Coupe is a new addition of the Elantra lineup from Hyundai. The new 2013 Hyndai Elantra Coupe shares the basic bones of the Elantra Sedan’ chassis. The sedan and coupe have the same wheelbase and the same MacPherson strut front suspension. The 2013 Hyundai Elantra Coupe competes with Honda Civic Coupe, Kia Forte Koup, Mazda3 and Toyota Matrix. The 2013 Hyundai Elantra Coupe is offered in two trim levels: GS and SE. The GS comes standard with 16-inch alloy wheels, full power accesories, heated mirrors, foglights, air-conditioning, cruise control, a tilt-and-telescoping steering wheel, heated front seats, a height-adjustable driver seat, Bluetooth and a six-speaker sound system with a USB/iPod interface. The 2013 Elantra Coupe SE adds 17-inch alloy wheels, a sunroof, a rear spoiler, leather upholstery, leather-wrapped steering wheel, aluminum pedals and a sport-tuned suspension. 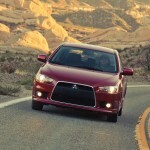 The Technology package is optional for the SE trim level. This package includes keyless ignition, keyless entry, automatic headlights, a navigation system, dual-zone automatic climate control, a rearview camera and a premium sound system. The 2013 Hyundai Elantra coupe comes with a 1.8-liter DOHC 4-cylinder engine with Dual Continuously Variable Valve Timing (D-CVVT) that produces 148 hp and 131 lb-ft of torque. A six-speed manual transmission is standard while a 6-speed automatic transmission with Shiftronic is optional. The 2013 Nissan Titan is a full-size pickup truck that has a reputation as a rugged, reliable, spirited choice for active truck buyers. The 2013 Titan is designed for work and play and remains one of the most distinctive-looking full-size truck on the market. 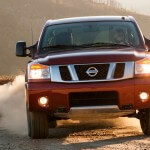 The 2013 Nissan Titan competes with Ford F-150, RAM 1500 and Chevrolet Silverado. The 2013 Nissan Titan has seating for up to six people and comes with two body styles: the Crew Cab (that is a conventional four-door cofiguration and offers a choice of long or short cargo beds) and the King Cab (that has rearward-opening rear doors). The Crew Cab is available in S, SV, PRO-4X and SL trim levels. The King Cab is available in S, SV and PRO-4X trim levels. The Nissan Titan PRO-4X models are available only with all-wheel-drive while all the others offer a choice of two- or four-wheel drive. The Titan’s updates for 2013 include standard step rails on SV and SL models, a new aerodynamic rear spoiler, a new optional wheels, a standard 120-volt outlet on SL models and a four-spoke steering wheel (that replaces the three-spoke design). The 2013 Nissan Titan is powered by a powerful 5.6-liter DOHC Endurance V8 engine that produces 317 hp and 385 lb-ft of torque. All 2013 Titan models come standard with a 5-speed automatic transmission.